Note: Unfortunately WOSS has stopped making suspension trainers of any sort for the time being since writing this article. It is a pity as their products was really fantastic and of great quality. If you are looking for an alternative to the more expensive TRX brand take a look at our best suspension trainers at the link below. The QonQuill Resistance Trainer is our top rated suspension trainer and good value for money. Today I have a review and a comparison between the WOSS Attack and the WOSS 3000 Equalizer suspension trainer and want to thank Mike Learned very much for allowing me to use his video where by he gives an excellent overview of the suspension straps side by side. If you are deciding between the Woss Attack and Woss 3000 Equalizer watch the video below by Mike. You will get a very good idea on how the WOSS Attack varies from the 3000. To recap from the video, the noticeable differences between the WOSS Attack and WOSS 3000 is that the Attack’s handles are shorter and are rubberized (makes cleaning easier). The straps are much wider and more robust giving it that Military grade feel. The cord attaching the handles to straps is also thicker and the D-Ring looks more robust. 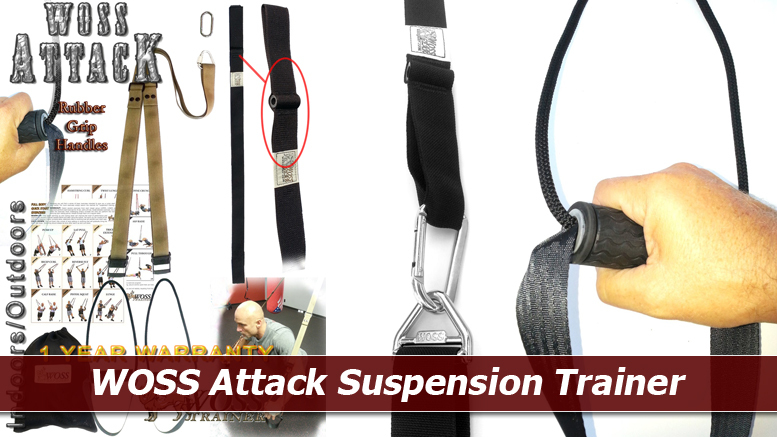 As Mike mentioned in his review video that if you are planning to really make the most out of your workouts and take it to the limit, the WOSS Attack suspension trainer is his preferred straps. WOSS Professional grade System – Made in the USA, using 1st Grade US Military Webbing. Rubber Sleeve Grips usually only found on $200+ Trainers. All WOSS Trainers are strong enough for anyone working out with them!! The Center Strap goes through our WOSS D-Ring which makes this Trainer more instable than other systems out there. The black Military Anchor Strap with built-in Door Anchor is perfect for tree trunks, branches, rafters, open beams, even a door. Take it to your local Gym and anchor it to their bar – fast and easy. Each handle is made with 3/8″ black cord, 1-3/8″ Rubber Sleeve Handle and with a 1-1/2″ wide soft foot loop for easy and comfortable support. Full Body Quick Start Exercises sheet demonstrating 18 exercises to get you started right away. Be the first to comment on "WOSS Attack Trainer Review"